A study of the great film studios of Old Europe. Or, at least, the bits of them they open up to tourists. Text by Spank The Monkey, photographs by The Belated Birthday Girl. Elstree. Pinewood. Shepperton. To a British fan of the movies, the mere mention of the names of our biggest studios generates an undeniable frisson. They all have one thing in common: if you were to go up to the front gate and ask to have a look around, they’d tell you to sod off. We don’t do film studio tours in the UK, and that’s a shame. Sure, there’s the Warner Brothers complex in Leavesden, but all they have to offer is a permanent Harry Potter exhibition that’s been constructed in the area where they made the films. For a tour to really work, you need to maintain a tourist attraction and a working production facility so close to each other that visitors to the former think they’re automatically part of the latter. That takes a lot of effort, and you suspect that many British studios would prefer to put their energy into making films. It’s a different story elsewhere, though: and on a recent jaunt around Europe, we visited two studios that have managed to make the balance work. 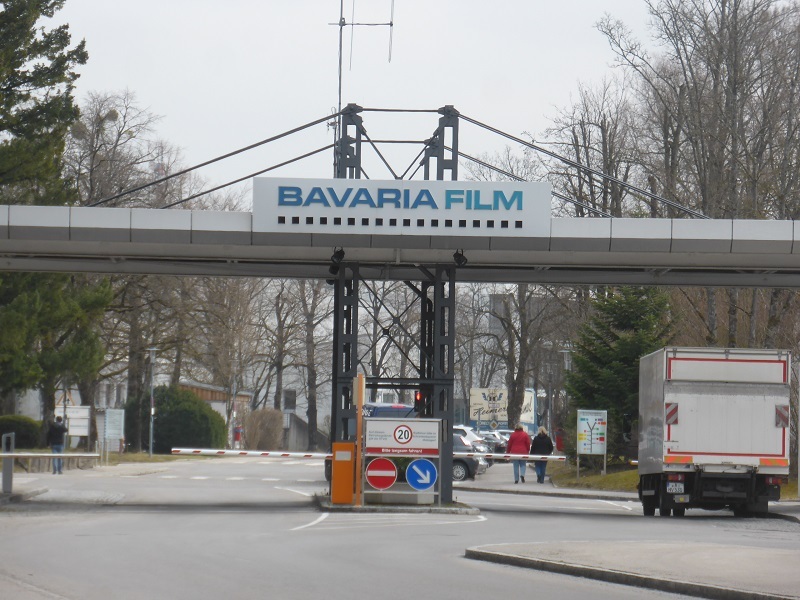 To Munich, first, and Bavaria Filmstadt: the tourist section of Bavaria Film Studios, home of German filmmaking since 1919. It’s a bit of a walk from the tram stop to the unglamorous visitor entrance at the back of the complex. But there are signposts along the way containing a quiz with useful facts regarding the site’s history – the studio where Hitchcock made his first film, the multiple Oscars won by Cabaret, and so on. Make the most of this: with two notable exceptions, the Filmstadt experience from here on in will focus relentlessly on what they’ve done in the 21st century, and more or less ignore anything before that. There are two main components to Filmstadt (plus an optional 4D movie ride), and you can choose to visit either or both of them. The main attraction for families is an interactive area called Bullyversum (named after popular actor/director Michael Bully Herbig), which gives kids lots of hands-on ways to learn about the filmmaking process. We decide to skip that and take the other option, a more traditional guided walk around the complex. There are frequent German language tours around the site throughout the day, but English-speaking visitors are limited to a single 1pm slot: on this particular day, our guide Julia is leading a small group consisting of the two of us plus a younger Spanish couple. Julia emphasises from the start that we’re visiting an active studio facility that’s regularly used for a mixture of both film and television productions. Having said that, there’s only one part of the tour where we get to see people actually at work – the custom-built visitor gallery for the studio of shopping channel 1-2-3.tv. They broadcast live 20 hours a day (only taking a break between 2am and 6am), and we get to watch the action on the studio floor from behind glass, like we’re in the good bit from Joy. The rest of the tour is based around areas containing sets and props from previous productions: the wrecked interior of Air Force One from Big Game, a small Viking village used in the Vicky The Viking movies, and some lush recreations of the Munich Residenz constructed for a 2012 biopic of Ludwig II. As the British representatives on the tour, we can feel the unspoken subtext that they could have filmed at the original Residenz itself if someone hadn’t bombed it to bits in the 1940s. For quite a bit of this tour, Julia has to apologise that she’s mostly talking about films and shows that were never shown outside of Germany. But eventually, she can relax and present the rooms featuring two of her nation’s biggest international hits. You suddenly realise that if Wolfgang Petersen didn’t exist, there probably wouldn’t need to be an English language tour in the first place. 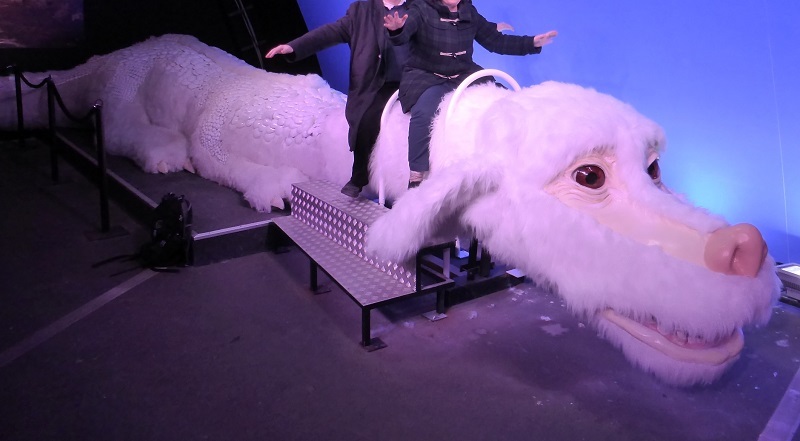 The younger Spanish couple are enchanted by the room dedicated to his The Never Ending Story, including a full-size rideable Falkor complete with optional bluescreen enhancement. 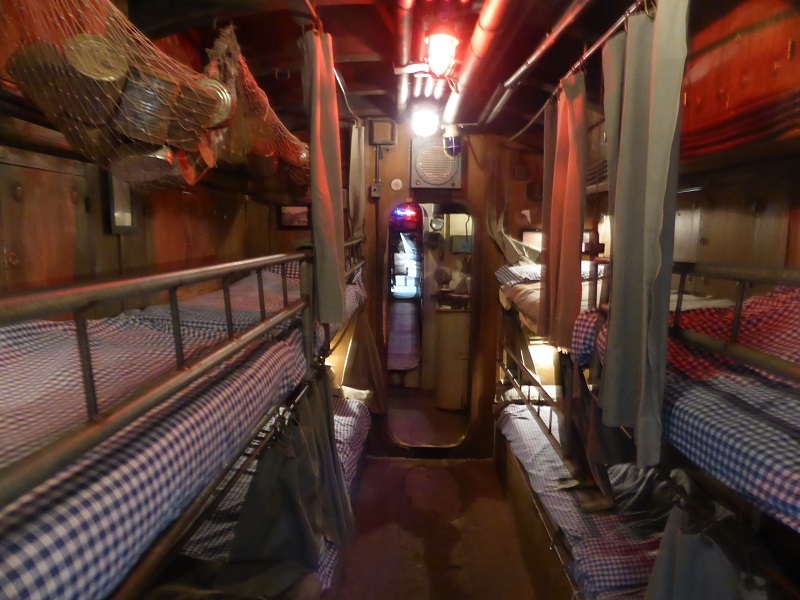 We, on the other hand, are more thrilled by the display for Petersen’s earlier Das Boot, and the chance to walk through the submarine set itself. It’s as detailed and as claustrophobic as it appears on screen, and you could spend hours peeking into its various nooks and crannies if there weren’t several other tours queued up behind you. The existence of Bullyversum doesn’t mean that the studio tour is entirely passive and serious. 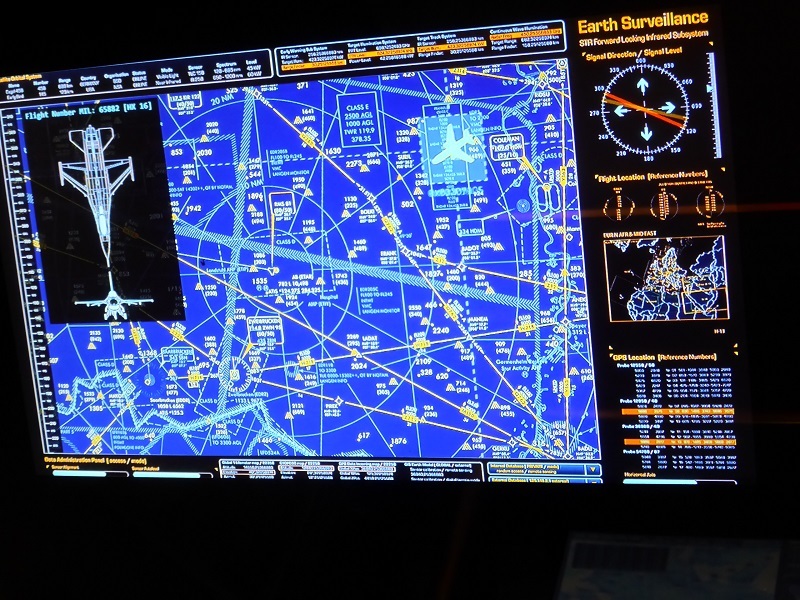 There are several displays dedicated to playing around with effects technology: you can stand in front of a weather map reading the forecast, or dive out of the way as a flying dragon approaches you. (The Belated Birthday Girl comes off worst in these scenes, as her blue and green checked coat makes her semi-translucent whether they’re using blue screen or green screen FX.) At the climax of the tour, the trickery is more old school, as all of us collaborate on a small improvised scene involving a mocked up train carriage and a background painted on a roller. In a way, it’s a bit cheeky for Bavaria Film to be calling its studio tour a ‘filmstadt’. European cinephiles would agree that when it comes to metaphorical cities with a cinematic emphasis, there’s only one worth mentioning, and that’s Cinecittà in Rome. 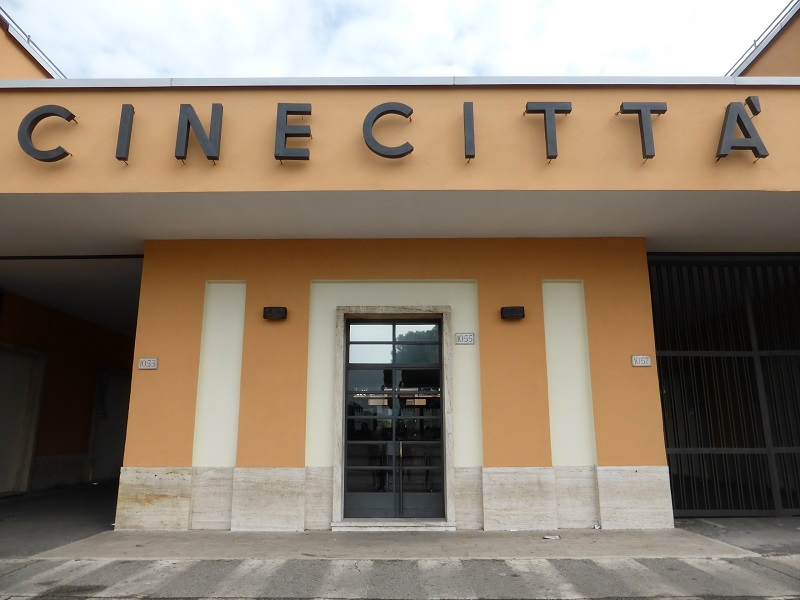 The legendary studio is open to the public six days a week, with an exhibit they call Cinecittà si mostra (or Cinecittà Shows Off). It’s a two-part deal: you can either visit an exhibition spread across the studio buildings, or combine that with a guided tour of the backlot. 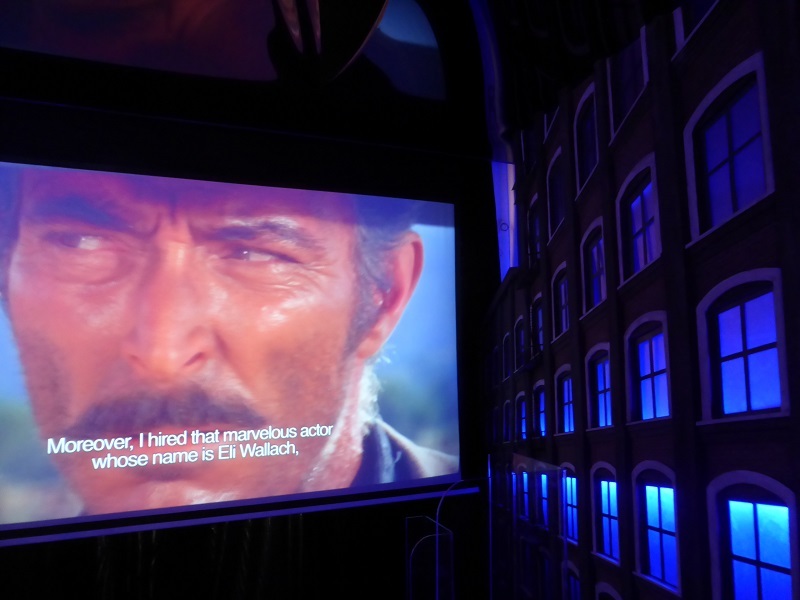 The exhibition is an intricately structured walk through Cinecittà’s role in Italian cinema. An introduction gives a brief overview of the early years of the studio, and doesn’t shy away from the awkward detail of it being originally Mussolini’s idea. That’s followed by a more detailed chronological breakdown by genre and time period, with smartly edited triple screen projections breaking down key scenes from the most important films. The story comes to an abrupt halt at the turn of the century, and is probably due for some sort of update in the future. But there’s plenty of terrific stuff there, and you’re bound to find at least one display to fall in love with. Personally, I can appreciate the importance of the collection of Fellini’s sketches and costumes, but show me a room dedicated to Sergio Leone and you have my full attention. But the tour is the reason why we’re here. The English language tours at Cinecittà are better promoted than their Bavarian equivalents, so our guide Giulia – no relation, presumably – has a party of twenty or so to take around the backlot. 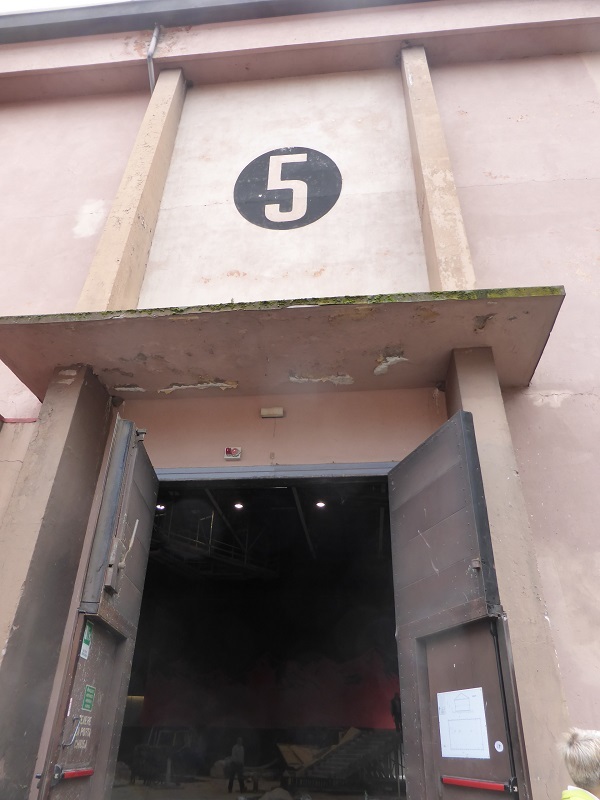 The tour starts and ends with Studio 5, Fellini’s favourite: although today we can’t go all the way inside because (to use Giulia’s favourite word) the ‘artisans’ are at work, dismantling a specially constructed screening room for the 70mm presentation of The Hateful Eight. In any case, the studio space is much less impressive than the things that have been constructed outside it. 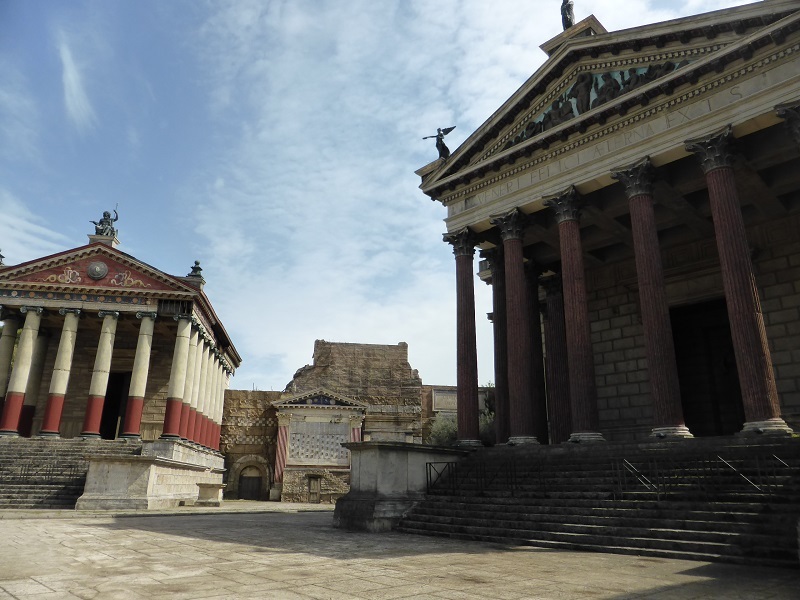 Cinecittà is renowned for the quality of its open air sets, and their approach to their use is interesting. Some of them are destroyed as soon as production has completed: others are kept by Cinecittà on the assumption that they might be able to use them again. This has an impact on the tour, because some of these sets are currently in use, and there’s only so much leeway they’re prepared to give visitors. So we only get to see the Gangs Of New York Broadway set from a distance, because it’s being filmed on: and we’re forbidden from taking photos of the Temple of Jerusalem from The Young Messiah, because the film hasn’t been released in Italy yet. But we get free access to a couple of large scale sets – notably one which started out life as 15th century Florence, but has doubled for Generic Italian Piazza on subsequent occasions, most recently for a Wes Anderson Prada advert. The absolute showstopper on the tour is the Rome set, made for the HBO series. It’s a full-sized depiction of ancient Rome in its heyday, with all the colours of the buildings still intact, and seeing it on TV is no preparation for actually walking across it. It’s a prime example of a set that’s been frequently reused since its construction, by everything from The Borgias to Doctor Who. (Although lower-budget productions like Spartacus and Plebs tend to use the cheaper Rome set in Bulgaria instead.) In a studio haunted by the ghost of Fellini, it’s appropriate that Giulia relishes pointing out the fakery of it all – the scaffolding behind the buildings, the hollow fibreglass they’re made of, the small section of Egypt built in one corner for Rome’s Cleopatra scenes. Both studio tours are absolutely worth the journey, although the focus is different in each case. Bavaria Filmstadt is the more hands-on of the two, and is probably the best for a family group: Cinecittà has a much better sense of its own history, and is more for the serious film buff. Either way, you’ll have a terrific day out – although don’t expect to meet any stars as you wander around the studios. Unless you count luck dragons, of course. Bavaria Filmstadt, Bavariafilmplatz 7, 82031 Geiselgasteig, Munich. English language tours are held daily at 1pm during high season, by appointment at other times. Cinecittà, Via Tuscolana 1055, 00173 Rome. English language tours are held daily (except Tuesdays) at 11.30am and 3.30pm. In both cases, check times with website before travelling.